Neil Anthony Morrissey (born 4 July 1962) is an English actor, voice actor, comedian, singer and businessman. He is known for his role as Tony in Men Behaving Badly. Other notable acting roles include Eddie Lawson in Waterloo Road; Nigel Morton in Line of Duty, and Rocky in Boon. Morrissey also provides the voice of many cartoon characters, including Bob, Roley, Lofty, Mr. Fothergill and Farmer Pickles in the UK version of Bob the Builder. Morrissey was born in Stafford, the third of four sons of Irish parents who were both psychiatric nurses. He and his youngest brother Stephen spent much of their childhood in separate foster homes, Morrissey spending most of his time at Penkhull Children's Home, under the care of Margaret Cartlidge. He attended Thistley Hough High School, in Penkhull, where he discovered a love for acting through the encouragement of teacher Sheila Steele. He studied for his A-levels at the City of Stoke-on-Trent Sixth Form College. It was there that he realised that his time in care would end at the end of his first year, aged 17, with the bleak prospect of a move to a working boys hostel that could end his academic and dramatic career. A solution was found through the family of his friend, Mark Langston, who fostered Neil until the summer of his 18th birthday. Neil had developed his skills and reputation as an actor though his teenage years at Stoke Schools Theatre, Stoke Repertory Theatre and Stoke Original Theatre, performing at the Edinburgh Fringe Festival in 1979. His application to the Guildhall School of Music and Drama resulted in an unconditional offer, which paved the way for the next steps in his theatrical growth. Arriving with no educational grant and no living funds, he was helped by the school to obtain an educational grant, and he 'sofa-surfed' for his first year with friends. During this time he and a fellow student started a street theatre act, which gained them an agent, and hence the required 40 hours of bookings to gain an Equity card. Offered the leading role as Robin Hood in The Theatre Chipping Norton's 1982 pantomime, Morrissey agreed to leave the Guildhall School in the first term of his third year. He quickly paid off his student debts by landing parts in film and theatre productions. In 1984, Morrissey played Able Seaman Matthew Quintal in The Bounty alongside Mel Gibson, Anthony Hopkins and Laurence Olivier. In the same year, he also appeared in episode 5 (of series 5) of the police drama Juliet Bravo, shown on BBC1. Morrissey shot to fame in the mid-1980s as dim biker Rocky in the ITV drama series Boon. In 1990, he played the lead role of Noddy in the British spoof horror film I Bought a Vampire Motorcycle, which involved many of the actors from Boon. His role as Tony in Men Behaving Badly was created to replace the character of Dermot after Harry Enfield's departure from the series. The series became one of the most popular UK sitcoms of the 1990s and turned Morrissey into a national star and a target for the tabloid newspapers. His ongoing romance storyline with co-star Leslie Ash led to the pair appearing in several advertisements for Homebase. In 1997, he starred in the Comedy Premiere The Chest and in 1998 two TV productions: the one-off My Summer with Des for the BBC and The Vanishing Man for ITV. Around 1999, Morrissey also starred in a comedy drama called Shakespeare's Birthday, in which he played a coach driver. One of his colleagues was played by Tony Selby. Morrissey also starred in the John Godber film about rugby league called Up 'n' Under and voiced several characters in the children's television series Bob the Builder, including the lead character; this led him to achieve two UK number 1 singles, with "Can We Fix It?" (which was the 2000 Christmas No 1), and "Mambo No 5" in 2001. In 2015, Morrissey was fired from voicing the character and the role was given to Lee Ingleby. He has, though, provided the narration for Morph (in recent years) and Maisy. In 2002, Morrissey returned to TV screens in the drama series Paradise Heights which ran for two series. He then had a starring role in the BBC sitcom Carrie and Barry from 2004 until 2005. In 2006, he was the guest host for an episode of Channel 4's The Friday Night Project before taking on the role as presenter on the BBC Two car related game show Petrolheads. In 2007, he appeared in British TV show Skins as the father of Cassie and made a guest appearance in Neighbours as a priest, remarrying long term characters Susan (Jackie Woodburne) and Karl (Alan Fletcher) on a boat on the River Thames. On 11 October 2007 he made his first appearance in the BBC's Waterloo Road as new deputy head teacher, Eddie Lawson. Taking the role to pay for his business problems, Morrisey was in this role for two series stating later that he left due to the poor quality of the scripts, making his final appearance in May 2009. In August 2009, he promoted a national tour of the play Rain Man. During the 2009 Christmas season he played the role of Buttons in the Pantomime Cinderella at The Assembly Rooms in Derby. Morrisey returned due to popular demand in the pantomime Aladdin playing the character of Wishey-Washey at The Assembly Rooms in Derby. In January 2012, Morrissey took on the role of Fagin in Lionel Bart's musical Oliver at the Palace Theatre in Manchester. In July 2013, Morrissey reprised his Skins role as Marcus Ainsworth, the father of Hannah Murray's character Cassie Ainsworth. He appeared in both parts of Skins Pure. Morrissey starred alongside Adrian Edmonson, Robert Webb and Miles Jupp in the play Neville's Island at Duke of York's Theatre, London during Autumn 2014. In 2015, he played a character called Keith, who is Johnny (Joe Maw) and Tee's (Mia McKenna Bruce) villainous step-father, in the CBBC sitcom The Dumping Ground, for one episode. In December 2015, Morrissey starred in BBC Two's comedy drama A Gert Lush Christmas, playing the father of Russell Howard's character. In 2016, he joined the cast of Grantchester for the second series. He played the role of Harding Redmond. Also in 2016, he took part in the second series of ITV's reality series Bear Grylls: Mission Survive. In 2017, he played the role of Greg McConnell in ITV's The Good Karma Hospital, and was Peter Carr in Series 3 of Unforgotten in 2018. His other West End theatre work includes Speed, Robin Hood, The Daughter In-Law and his critically acclaimed West End performance in A Passionate Woman. In 2005 Morrissey performed in Victoria Wood's musical adaptation of Acorn Antiques alongside Julie Walters, Celia Imrie, Duncan Preston and Josie Lawrence. Morrissey took over the role of Nathan Detroit from Nigel Lindsay in the London revival of Guys and Dolls from March to June 2006. On 1 April 2006, a BBC Three spoof programme titled Neil Morrissey's Secret documented sides of Morrissey's life that were previously unknown to the world at large. It alleged he has a house, wife and two children in Jordan as well as a degree in Botany for which he had studied for 20 years. These studies were integral to his motivation to find a breakthrough in anti-ageing. According to the documentary he has invented a cream called 'The Essence' which contains extracts of a plant found only in a remote Jordanian village. In the documentary the cream's acolytes include celebrities such as Jane Seymour, Gloria Hunniford and Philippa Forrester. The show followed Morrissey as he carried out his research which involved years of study and crossing continents, funded by his lucrative acting career. Ultimately Morrissey launches the cream only to have his friends concerned for his health, his laboratory broken into, and a trip to Jordan where he finds that the villagers whose trust he had gained through time spent with them, have abandoned their homes because of the fall-out of his discovery. This hoax was launched on 1 April and despite the suspicions caused by this date as April Fool's Day, it still managed to convince some people that it was true. Morrissey's love of Welsh poet Dylan Thomas led him to buy up numerous properties in the village of Laugharne, including the Hurst Hotel, the New Three Mariners pub and Brown's Hotel in April 2004 for £670,000. In October 2006 it was announced that the business had put Brown's Hotel on the market in order to finance the redevelopment of the Hurst Hotel, and the expansion of the private members' club, Hurst House in Covent Garden, London. In July 2008, with delays encountered on the construction of Hurst House-at-the-Mill, a luxury hotel in Hertfordshire due to open in 2009, the Laugharne-based assets of the Hurst House group went into a packaged administration. The assets were subsequently bought by new investors backing Roberts, resulting in the end of Morrissey's association with Laugharne. 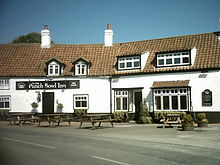 Morrissey part owned the lease on the Ye Olde Punch Bowl Inn in Marton, North Yorkshire. From this base came the Morrissey Fox range of real ale beer, developed by Morrissey and chef Richard Fox which is still in production. In June 2009, it was reported that his Welsh pub had failed and the lease to Ye Olde Punch Bowl Inn was handed back to the owner after just 18 months on 22 October 2009. Morrissey avoided bankruptcy over his failed business ventures but entered an IVA. Morrissey now owns a chain of pubs in Staffordshire, including The Plume of Feathers in Barlaston, and more recently The Old Bramshall Inn in Bramshall The latter opened its doors as a Neil Morrissey pub on 28th June 2018, an event that Neil Morrissey attended. Morrissey married Amanda Noar in 1987 after meeting her when she guested in an episode of Boon; the couple have a son born in 1989. The couple divorced in 1991. He then became engaged to actress Elizabeth Carling, whom he had first met in 1989, when she too was working on Boon. They parted on good terms, and she later guest starred alongside him on Men Behaving Badly. His subsequent affairs have been well documented by the British tabloids, including dating Rachel Weisz after starring together in My Summer with Des in 1998. They lived together at his flat in Crouch End, London. Morrissey has numerous tattoos. According to one version of their origin, he applied them himself with needles and Indian ink. On his left arm is his first name and a blob which was going to be his initials before it became infected, causing him to require a tetanus jab. On his right is a squiggle which is a reversed version of The Saint logo. Morrissey himself says the tattoos were done by other boys at the children's home. The boys there apparently saw that he did not have a tattoo and so gave him the option of a tattoo or a beating. He decided on the tattoo and now regrets not taking the other option. In 2006, Morrissey was awarded an honorary degree from Staffordshire University. He is a supporter of Crystal Palace FC. A fan of real ale, in 2011 he produced a real ale with the club called Palace Ale. 1984 Juliet Bravo Oliver Guest appearance – 1 episode; series 5 "No Peace"
Hammer House of Mystery and Suspense Policeman Guest appearance – 1 episode; "Paint Me A Murder"
1987 Pulaski Tarquin Taylor Guest appearance – 1 episode; "The Price of Fame"
1993 Comedy Playhouse Danny Guest appearance – 1 episode; "Stuck on You"
The Smell of Reeves and Mortimer Himself Guest appearance – 1 episode; "Food and Drink"
2004 Unsolved History Narrator Guest appearance – 1 episode; "Aztecs: Temple of Blood"
Neighbours Vicar Guest appearance – 1 episode; "Births, Deaths and Marriages"
2014 Comedy Playhouse Jez Guest appearance – 1 episode; "Over to Bill"
^ "BBC Two – Neil Morrissey: Care Home Kid, Episode 1". BBC. 28 March 2011. Retrieved 8 January 2012. ^ "BBC - Neil Morrissey and Charlie Brooks to guest star in series three of The Dumping Ground - Media Centre". Retrieved 23 December 2016. ^ "RUSSELL HOWARD, NEIL MORRISSEY, GREG DAVIES, KERRY HOWARD & SOPHIE THOMPSON STAR IN A NEW ONE-OFF CHRISTMAS SPECIAL FOR BBC TWO - Avalon Management". 11 November 2015. Retrieved 23 December 2016. ^ "Neil Morrissey joins the cast of Grantchester". Retrieved 23 December 2016. ^ "Michelle Collins, Chelsee Healey join Bear Grylls show". 18 February 2016. Retrieved 23 December 2016. ^ "Neil Morrissey's Secret". BBC. Archived from the original on 29 April 2006. Retrieved 16 October 2013. ^ "Morrissey ends Laugharne connection". Western Mail. 11 August 2008. Retrieved 16 October 2013. ^ "Neil Morrissey gives up the Punch Bowl". Thepublican.com. Retrieved 16 October 2013. ^ "Neil Morrissey 'opts for IVA to repay £2.5m'". The Daily Telegraph. London. 17 August 2009. ^ "Holden and Dennis marriage ends". BBC News. 27 December 2002. Retrieved 16 July 2010. ^ "Famous Football Fans". The-football-club.com. Archived from the original on 26 June 2012. Retrieved 16 October 2013. ^ "Crystal Palace | News | Latest | Latest | Manc Ale Is Coming To South London". Cpfc.co.uk. 12 July 2011. Archived from the original on 21 November 2011. Retrieved 16 October 2013.